The con-job played by then-Mayor Mitch Landrieu, facilitated by an obsequious local media, and prolonged by the current management of City Hall regarding the Civil War statues continues to drag out and at this rate it won’t be resolved any time soon. The city of New Orleans had no plan as to how they would be transferred to an appropriate venue at the time they were removed under the rifle scope of masked snipers and it doesn’t seem like one has materialized in the two years since the first monument was taken down. And the longer the matter drags out, the more likely they will remain in a city lot in an industrial area since it’s unlikely Mayor LaToya Cantrell would want to touch a political third-rail issue near her reelection campaign. 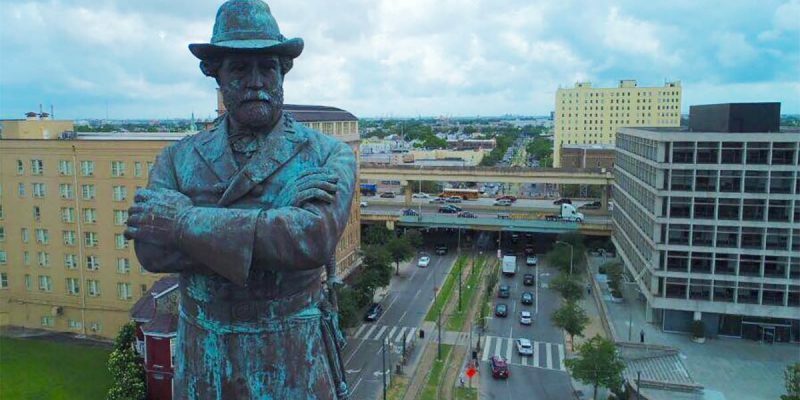 The sad reality is that as New Orleans is becoming a bastion of political progressivism, it is likely many other monuments, Confederate and otherwise, will eventually be removed from the city landscape. We’ve seen the war on history move beyond the Confederacy and on to Thomas Jefferson statues and George Washington memorial plaques. Even President William McKinley is not safe as his statue was removed from Arcata, California. Why was the monument to a Union war vet who served at the bloody battle of Antietam ditched? Because McKinley was considered an imperialist president for leading the United States into a war against…wait for it…a colonial power (Spain). At least the McKinley statue ended up in a place where it would be maintained and appreciated, his home town of Canton. Since the statues of Jeff Davis, General Lee, and Beauregard won’t be the city’s last removals, an exit strategy needs to be executed for those monuments and their fellow historical emigres lest the city’s storage yard end up becoming a de facto museum to American history and cultural Marxism. And as it is abundantly clear that The City of NO history doesn’t have a plan, then it’s time to turn them over to the state of Louisiana for preservation, protection, and proper historical interpretation. There are numerous secure state-owned historically appropriate venues that these monuments would greatly enhance. The Old State Capitol, where the vote to secede from the Union transpired and later served as a POW prison for captured rebels, would be a natural home though the Democratic city government in Baton Rouge would almost certainly object. The Port Hudson battlefield north of Baton Rouge would be a suitable home as well. Though largely forgotten, the siege of the Confederate bastion on the Mississippi River was one of the most significant military engagements in the war. Also, Port Hudson would be a far less controversial and visible venue. The Mansfield State Historic Park in northwest Louisiana is another potential location. The battles of Mansfield and nearby Pleasant Hill were two of the largest Civil War actions west of the Mississippi River. Furthermore there’s an annual commemoration of the battles through living history programs with re-enactors and other events held in conjunction with the anniversary, which is next week. Then there’s Louisiana’s less prominent military museum at Jackson Barracks on the border of St. Bernard Parish and the lower Ninth Ward. A national guard installation, Jackson Barracks would be the safest place for the statues and a relevant one as the museum had been entrusted with General Beauregard’s saddle right before Hurricane Katrina and a young Robert E. Lee was once stationed at the facility. Having officially (and absurdly) designated these historic works of art as nuisances as part of the official reason they were taken down and lacking the political will to make a decision as to their future, the city of New Orleans needs to pass the hot potato off to state officials who are less susceptible to the cries and shouts of the down-with-everything crowd. Next Article How Is JBE Going To Square Up With National Democrats He Expects To Be Bankrolled By?